Teri began her professional career as a Graphic Designer having obtained a First Class Honours Degree at Bath Academy of Art in the southwest of England. She worked at several top London design agencies during her 18 year design career. Her Award Winning Jewellery career started with an evening class in 2001 at Kensington & Chelsea College in London where her joy in the physical act of making was rekindled - and went on to take over her life, becoming her second career over the following years. She established her jewellery studio in 2006 at the famous Cockpit Arts Studios in Holborn, London, where she remains still, making, teaching and exhibiting her distinctive work worldwide. Inspired by her mother's sewing room full of treasures, her work is influenced by her love of textiles and of making by hand. 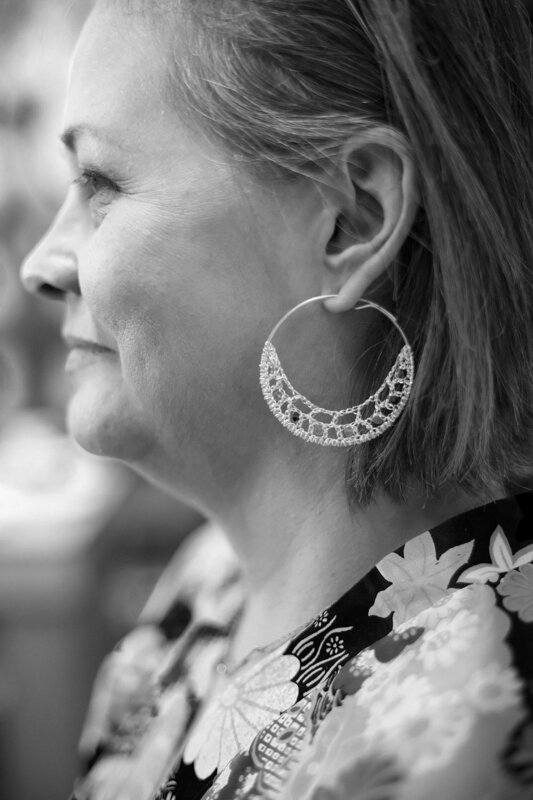 Her use of intricate hand crochet techniques in pure gold has become her signature style - often incorporating tiny coloured facetted diamonds crocheted into individual stitches. This combination of traditional textile techniques with unconventional design and her unique diamond setting - has led to her pieces being described as "instant Contemporary Classics". Since 2015 her work has been selected for exhibition at the world famous Goldsmith's Fair held annually at Goldsmith's Hall in Foster Lane - home to The Worshipful Company of Goldsmiths, London's oldest Livery Company founded by Royal Charter in 1327. Her work appeared in the prestigious Financial Times "How to Spend It" feature in 2015. In a stunning start to 2019 she scooped a Gold Award in the Goldsmith’s Craft & Design Awards for her ‘Ruffle’ Brooch, and a Bronze Award for her ‘Talon’ Earrings.